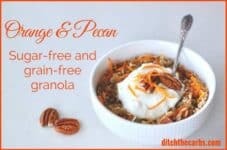 Ah-mazing sugar-free orange and pecan grain-free granola. Low carb, healthy, nutritious and unprocessed real food. Who wants fortified ultra-procesesed cereals anyway? If you have been following my website for some time, you know my grain-free granolas are legendary, and why I haven’t bought cereals/granola for 3 years. I encourage you to read my post on cereals/granola and the top 5 myths people believe that whole grains are healthy and a great start to the day (spoiler alert- they’re not). And watch this little video to see why I ignore the food star ratings, the Heart tick and pretty much anything with a cartoon or a barn on the packaging. The video is pure gold! Once you have made my orange and pecan grain-free granola, you might wish to try my other flavours – the basic recipe, chocolate grain-free granola , fennel & ginger grain-free granola or how about my grain-free granola bars? I make a big batch and this lasts our family of five for 2 – 3 weeks. From the pictures I am tagged with on Instagram, looks like many of you are in this routine also. Serve orange and pecan grain-free granola with coconut cream, unsweetened natural yoghurt, and a few low sugar berries. Stable Blood Sugars – One reader sent me his stable blood glucose readings after enjoying my other grain-free granolas with berries and unsweetened yoghurt. Orange and pecan grain free granola is the perfect way to ditch the boring cereals and toast. Paced with flavour and nutrition. One batch will last a couple of weeks. 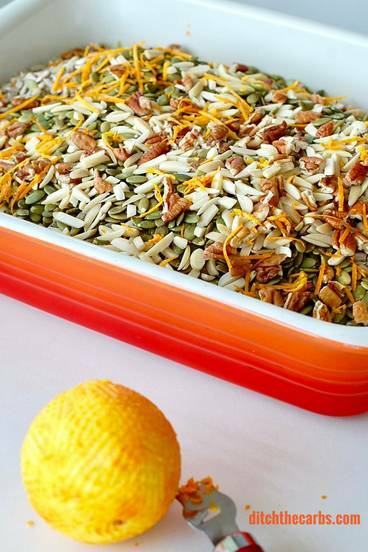 Place all the nuts and seeds on a baking dish, then mix. 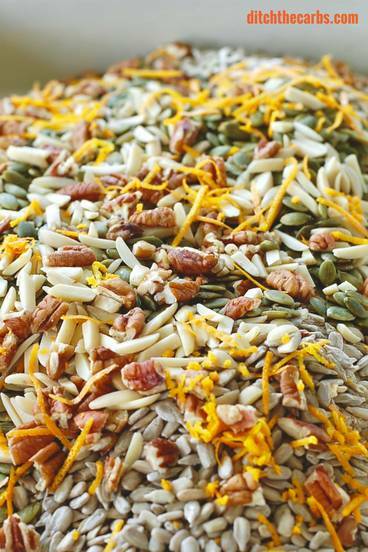 Pour the melted coconut oil over the mixed nuts and seeds, add the sweetener and orange zest. Mix again. Once the entire grain free granola is browned and baked, remove from the oven and allow to cool completely before placing in storage jars. Serving size is 1/2 cup, aprox 45g. I store mine in the pantry, even in the summer where it should last for up to a month. Alternatively, store in the fridge for up to 2 months or can be frozen for up to 3 months. Making this morning. Tweaked a little as we had eaten all the pecans so making with walnuts and keeping the almonds separate ( husband allergic). Smells so good!! I am not sure why the psyllium? I use it when I bake LCHF bread which helps with the texture, but I don’t understand why it should be in granola? Otherwise the recipe looks delicious! This recipe looks really amazing! Is it suitable for all seasons? You dont say how your granolas should be served; should i eat it dry, pour milk over it, yoghurt or what? In your book, the pic accompanying the fennel and ginger granola includes an image of what looks like a bottle of milk…..is this what i should use please? Diolch/thank you. How you serve it is up to you and how low carb you would like to be. My children tend to have it with full fat milk or natural yoghurt. My husband always has it with natural yoghurt and coconut cream to amp up the healthy fats (it keeps him full until lunch this way). My children also like it sprinkled on top of whipped cream as a quick dessert with berries. This recipe sounds great. Would it be okay if, instead of coconut cream, I used 11% fat plain Greek yogurt? 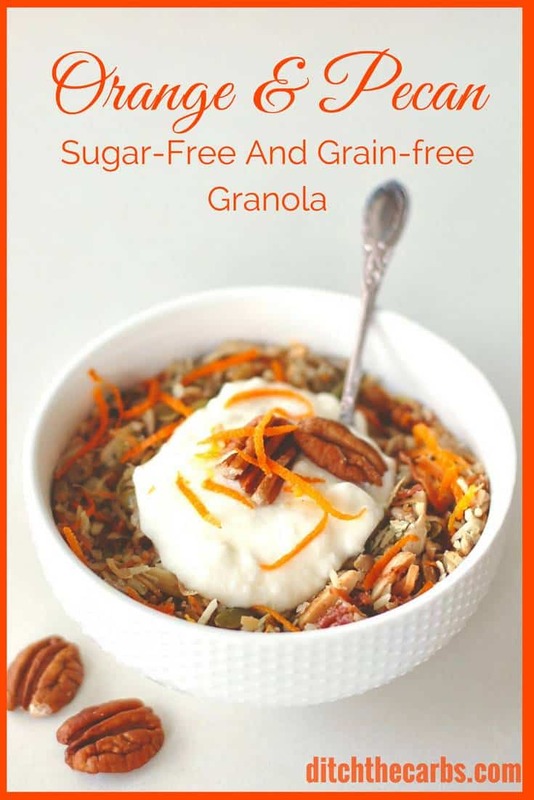 I love the thickness and creaminess of this and the thought of having your granola with it, sounds yummy. Would that be enough for a breakfast, or should I add something else? What could the pumpkin seeds be replaced with? 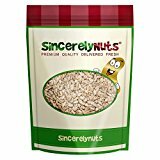 I am allergic to them, so could I use walnuts or another seed? The beauty with these grain free granola recipes, is that they are so adaptable. 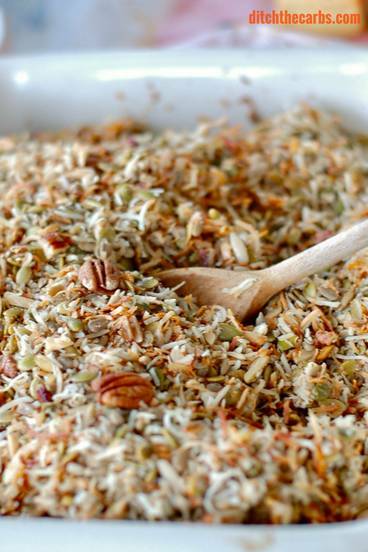 You may use any combination or seeds and nuts that you enjoy and can tolerate. Hi, I’m so glad you have a recipe for granola, it ratified my crunch craving. One question, I see in the ingredient photo you use David’s Sunflower seeds, they are in the shell. Shouldn’t I use installed seeds?? Thank you for your devotion to the Low Carb lifestyle!! Great question, I’ve amended the image to show hulled sunflower seeds. And thank you for your lovely comments, it is my pleasure to devote myself to low carb living, I love it! 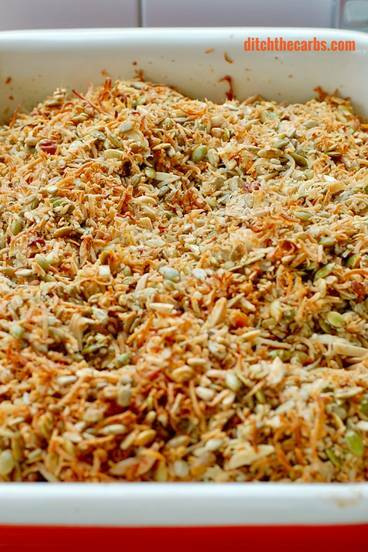 I can only see one addition of pumpkin seeds in the recipe. Are you able to send me a screen shot? I can then see where this has occurred? Hello! I’m so glad I’ve stumbled upon your site! Thank you! I haven’t done this much baking in several years! I do have 2 questions: I see that you use coconut cream for your granola. Do you just leave it as is, whip it, or mix it with your yogurt? I’ve never used coconut cream before. Many of your flavoured granolas use sugar substitutes. I know things like stevia and swerve aren’t supposed to impact blood glucose but I’m still new to this. How often (a week) should one be consuming a sugar substitute?I realise it varies for each person. Just looking for a general idea. Again, thank you so much for sharing all this hard work! Could you use seeds, such as sesame or chia instead of the psyllium? 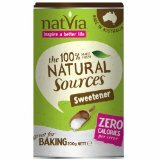 The sweetener in the recipe is granulated so measures spoon for spoon in place of sugar, you may be thinking of pure stevia whereby you would only use it in the range of a fraction of a teaspoon. This is a great article – Ultimate guide to low-carb sweeteners. 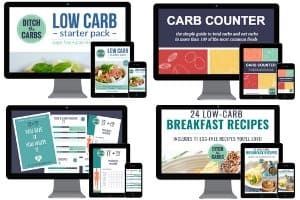 All my recipes also state “to your own taste” as this is the most common aspect of low-carb baking that we need to individualise. 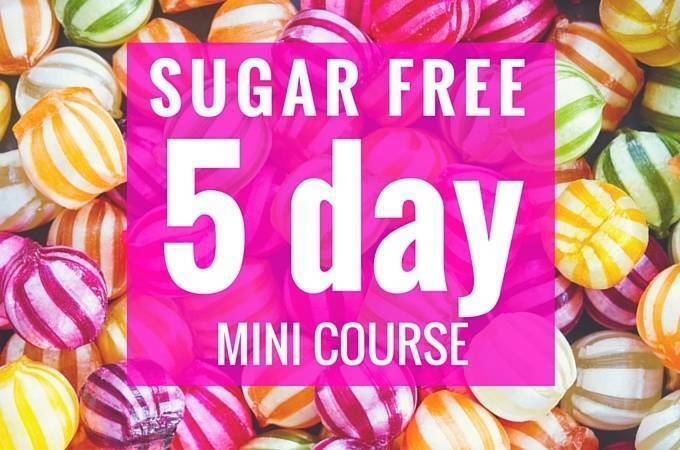 We are all on such different parts of our low-carb and sugar-free journey. So what might be sweet for one person, may be excessive or inadequate to another.